I recently conducted a poll on my Twitter stream, asking followers how often they created a new automation on their Mac. Of the sixteen people who responded, half said that they rarely created a new automation. The other half said they created new automations using one or more Mac automation programs (Keyboard Maestro, BetterTouchTool, Hazel, TextExpander, Dragon Dictate, PopClip, smart folders, and iClip) regularly or a few times a month. How often do you create a new Mac workflow, action, or hack using one or more of the following apps: Keyboard Maestro, BetterTouchTool, Hazel, TextExpander, Dragon Dictate, PopClip, smart folders, and iClip? The poll I conducted is a small sample, so feel free to way in on how much you create automations on a regular basis. How often do you create automations on your Mac? The responses I received started me to thinking, what could I do help my followers and subscribers create more automations to reduce redundant tasks and be more productive? To this end, I decided to create a 5–Day Mac Automation Challenge. Would you like to reduce the steps it takes to perform an action? Would you like to type faster? Do you like seeing actions performed for you on your Mac? Do you want to try out new features in a Mac automation application? 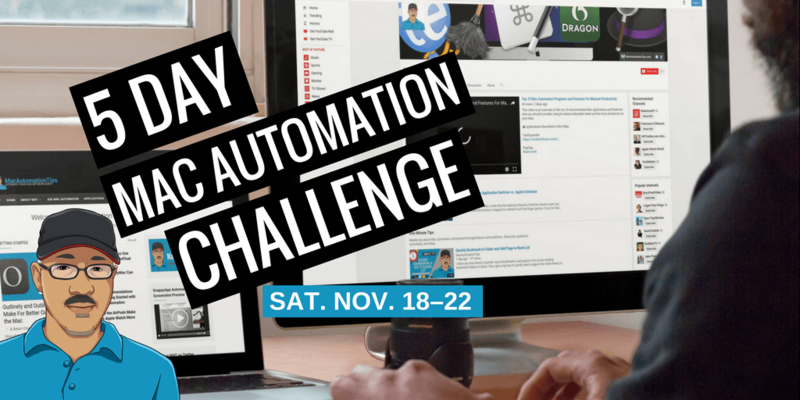 Starting Saturday, Nov. 18 the challenge will be to create one or more new automations a day for a tasks that you repeatedly perform. To challenge you to create automations on your Mac that help make you more productive. To kick off and develop my new MacAutomationTips YouTube Channel, and particularly the 1 Minute Tip Playlists. To kick off the MacAutomationTips Facebook Group. And to help build community among Mac users, power users, and automators. To participate in the challenge, you simply have to use the automation applications or features you already have. The automation can be something as simple as creating a new text expansion for a word or phrase that you regularly type (using TextExpander, Alfred, TypeIt4Me or some other application) to creating finger gesture actions in BetterTouchTool or a string trigger action in Keyboard Maestro. During the 5-day challenge, I’m challenging myself to post one new 1 minute tip on YouTube that you might inspire you to create new automation. There are of course lots of tips and strategies on my blog that you can look through for ideas as well. And most importantly, if you share what you’re doing, you can inspire others in the community. I hope that during the 5 day challenge that you will share about the automations you’re creating. If you can include a screenshot or short video that would be even better. If you’re already a subscriber to this website, you’ll receive daily updates in the email. If you’re not a subscriber, be sure to join today in time for the challenge. I hope you’re looking forward to this challenge as much as I am. I look forward to learning about what you’re doing with Mac automation. Not much of a challenge to me, I am always looking to create more productive shortcuts. I usually set a few minutes on Friday mornings to think back on what Keyboard Maestro shortcuts would have made the week even easier. Awesome, that’s what I like to hear. The challenge is to help other Mac users create more automations, or at least get started. Hope that you will share some of the workflows you’re creating. Awesome. I look forward to what you will share. What automation programs do you regularly use? Let’s get started! Looking forward to it. Would like to learn more about Keyboard Maestro but learning about any of the automation tools is cool too. Definitely, the Keyboard Maestro will be released early next year. I am hoping for some inspiration for KM! You got it. I will definitely did a few tips this week about KM. Thanks for your feedback.